Spud and Chloë at the Farm! Wow, this weekend was a whirlwind! I was lucky enough to get a coveted spot in Susan B. Anderson's knitting workshop at Stitcher's Crossing, in Madison. The event was in celebration of Susan's new book, Spud and Chloë at the Farm. Lucky for me, Paul plays in a yearly curling fundraiser, Curl vs. Cancer, with his father, and it happened to be the same weekend as the workshop! The fundraiser is put on by the Madison Curling Club and they raised a lot of money for cancer research, which is wonderful! We drove to Madison Friday, and had a great Wisconsin fish fry with his parents and then we got schooled in Euchre. Saturday morning Paul's sisters and mom and I found my bridesmaids dresses and had lunch and then I drove to Stevens Point to visit Emily. She turned 21 on Tuesday and I was thrilled to get to spend the night with her. We had a great night of wine and movies. Can you believe she had never seen When Harry Met Sally?! I raced back to Madison Sunday morning and got to Stitcher's Crossing in the nick of time. In the class, we were given a book preview pamphlet and the complete pattern for Mice, from the new book. All of the projects are so adorable! I can't wait to get mine; the books are shipping at the end of March! There were about 20 women in the class and most were from the Madison area. There was another woman from Green Bay, however, who, like me, arranged her entire family's weekend around the class! And I thought it was just me! The class was two hours long, so we all tried to complete a mouse, while watching Susan give demonstrations and checking out all of the amazing samples she brought from her other books. I first learned of Susan when I bought Itty-Bitty Toys from a shop here in Davenport. By the end of class I had almost finished a mouse. I just needed to make the feet and stitch on the face. I finished the feet on the car ride home, and I stitched the face on tonight. And here is the finished product! How cute is that! The book has twelve more patterns, including a barn, fence, and hay bales. I seriously cannot wait to make them all. 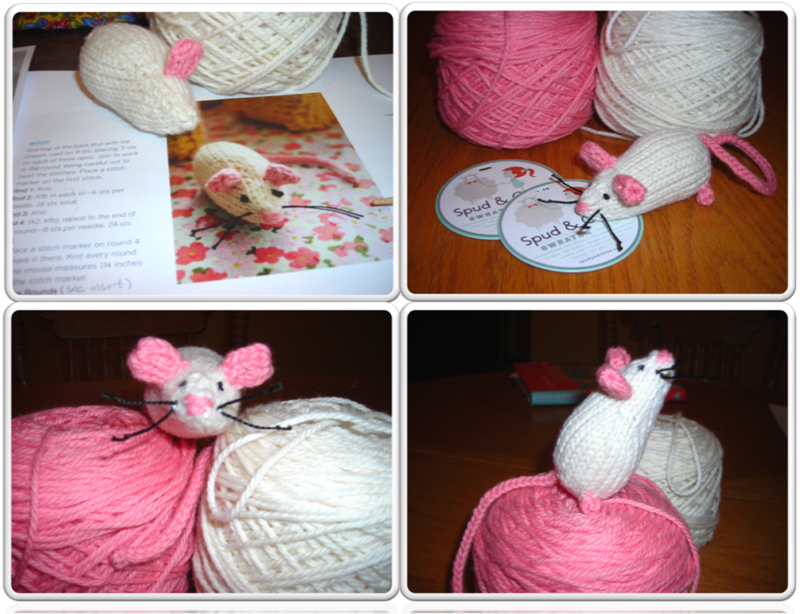 The mice are made from Spud and Chloë Sweater, and I probably have enough to make fifteen mice. I'm holding out for the book though, as Susan said she overlapped the yarns in a lot of the patterns, so you don't need to buy as many skeins. I've never knit with Sweater before and it's just as great as everyone says. So easy to work with and knits up beautifully. Another awesome part of the day was that Susan had a bunch of give-aways for us from Blue Sky Alpacas. Patterns, yarn, and the cutest little project bag. It was a wonderful afternoon and definitely worth the drive! Thanks, Susan, for the awesome experience! The Eldridge Knitting Nook! And Dorrie the Little Witch. Yesterday I woke up earlier than usual, but I had no problems getting out of bed. I was going in to work early, so I could leave work early, for a very special reason: the Eldridge Knitting Nook knitting group! The next hour and a half were a happy blur of knitting and meeting new people. It is my understanding that this will become a weekly meeting, with yarn swaps and book swaps and even some more formalized instruction. Of course, everyone at the meeting was willing to help out any novice knitters, crocheters, spinners or other types of fiber enthusiasts. There also will be a later meeting on Thursdays (next week is the first from 5-8. I'll keep you posted on the details). I will definitely be trying to make this a regular occurence. Maybe I'll even go both nights! I might actually teach a class myself on the technique of entrelac. 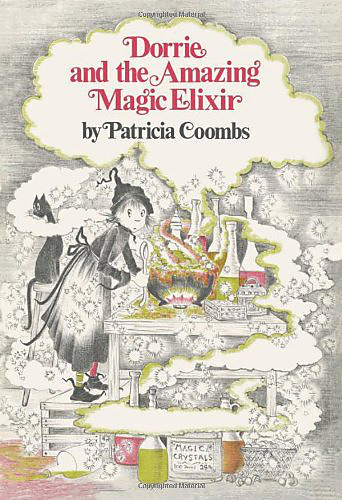 Tammy asked me about it when she saw me wearing my new cowl, with colors reminiscent of the "Dorrie the Little Witch" books by Patricia Coombs. I loved these books when I was little, and I still do. They actually cost quite a bit of money now on the secondhand market, but we just borrowed them from the public library when I was growing up. They are usually only printed with a few colors of ink, like in the picture above. 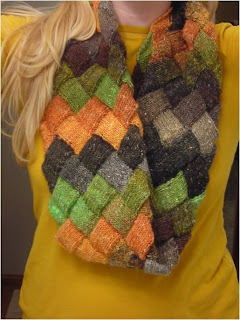 I was originally inspired to try entrelac when I saw Miss Effie's entrelac scarf, made of some type of Noro, at the Crafting at the Convent Retreat. I searched Noro Silk Garden Lite on Ravelry, and although it is discontinued, there are quite a few people willing to sell a few skeins from their stash. ﻿I bought these skeins from a fellow Raveler (exuse the poached stash photo, please!) in part because they made me think of Dorrie, and I could not wait to get them in the mail. I cast on as soon as I received them, and two weeks later, I had this! 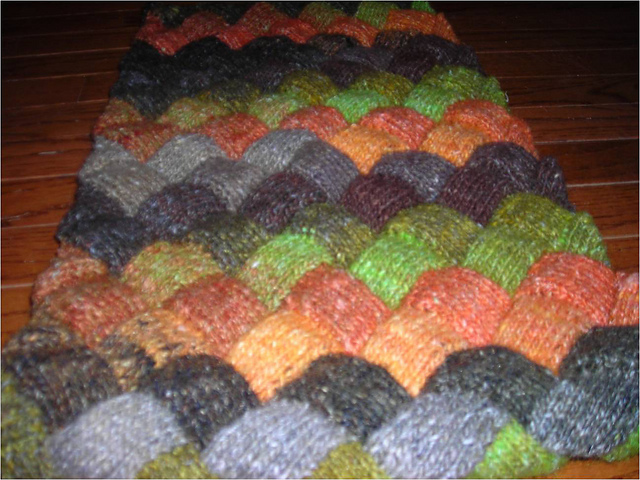 I love the way the entrelac is so squishy before blocking and in fact, I don't plan on blocking this one at all. I started off with this pattern from Alison LoCicero. It's free on Ravelry and her website and very easy to understand. ﻿As usual though, I had to change things up a bit. I cast on additional stitches for two more rectangles per row, and started on my merry way. It didn't take long to realize that I did not have enough for a normal length scarf. I then got out my pencil and paper and did a little math. By calculating the area in square inches the pattern produced in its original form and then the area my guage, width and yardage was going to get, I confimed my suspicions. I decided to keep on knitting though, and then sew the ends together to create a cowl instead of a scarf. This turned out great, and I like it even better because you don't have those pesky scarf ends to worry about. I usually wear it as shown in the first picture, doubled and then folded over itself at the bottom. I love the Noro colors and the way they change in this project, which is surprising given my usual aversion to all yarns variegated. However, the use of entrelac makes it looks very structured and planned out, don't you think? That's all for now, but stay tuned for more knitting in public (and maybe even some spinning)! And please, please try to come to the new knitting groups in Eldridge if you are at all intrigued. Ever since the Crafting at the Convent weekend this past January, opportunities for knitting in public have been popping up everywhere! First, though, I'd like to show you some pictures of the projects I finished that weekend. 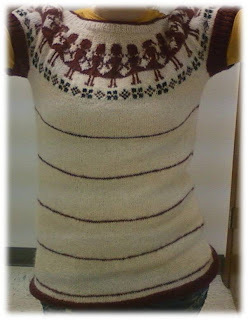 I started a Paper Dolls sweater this summer while I was visiting my family in Marinette. 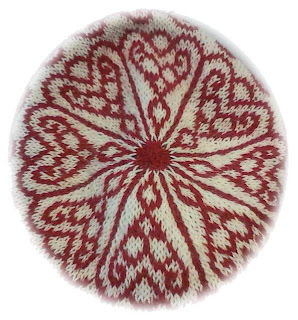 It was designed by the fabulous Kate Davies of one of my favorite knitting blogs, Needled. I made a few modifications to the pattern.For one, I knit it much, much longer than the pattern called for. 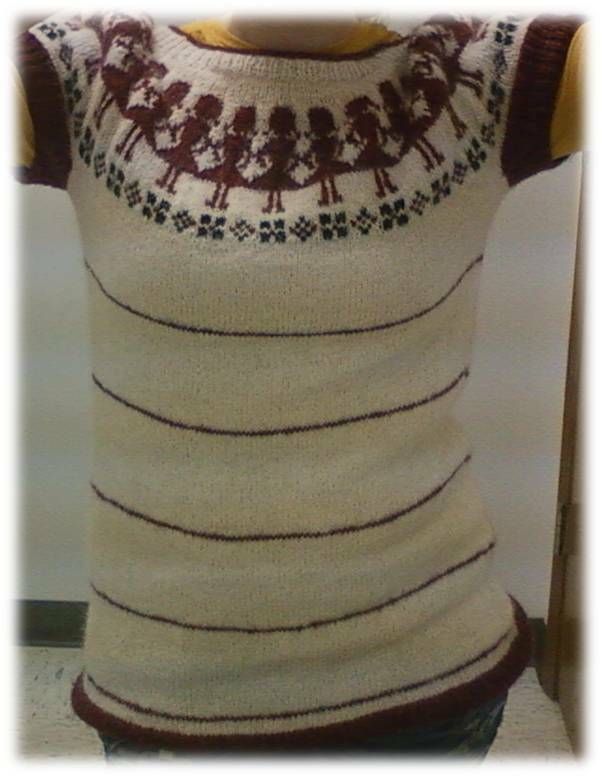 I have a very long torso, so I usually need to add at least five inches to sweater patterns. I added some skinny horizontal strips to break up the body. For the actual paper dolls, I added pigtails and omitted the eyes and mouth. I though they looked a little bit skeletal, and I'm pretty sure I wouldn't cut in facial features if I were making real paper dolls. I also cast on using a tubular cast-on and worked in K1P1 ribbing in one color. I don't usually like corrugated ribbing because of how the purl bumps pop out. It just doesn't look right to me, but I did see some examples of the sweater on Ravelry that looked amazing with the corrugated rib. I'm just set in my knitting ways, I suppose. Oh! And the yarn I used was Un-Spun Icelandic from Schoolhouse Press that I bought at the Sow's Ear in Verona, WI. The other project I worked on was designed by one of my former favorite knit bloggers, Jared Flood of Brooklyn Tweed. I made the Beaumont Tam using the exact yarn and colors suggested in the pattern, which can be found in the booklet Made in Brooklyn. I say former favorite because Jared used to host a really warm, friendly blog that was a wealth of knitting information and beautiful pictures. In the past couple of years he has become very well know and his patterns are extremely popular. As his popularity rose, the blog became less and less inviting, in my opinion. In the old days of Brooklyn Tweed I loved following projects through multiple posts and learning in depth about the yarns and techniques used. The blog was an open dialogue between readers and Jared. As of late, I feel the new Brooklyn Tweed is merely a means of churning out patterns to a captive audience who fell in love with the old blog. The posts lack depth and almost always contain a link to a pattern for purchase. This is just my opinion, of course, and all of the patterns Jared creates are gorgeous, which is why I've knitted several of them. Enough of my ranting, though, here is my Beaumont Tam! There is talk of getting a knitting group together with the fine knitters that were at the convent, possibly meeting in Dewitt. This is still in the early stages of planning, but while we are figuring out the details, there are some more established groups that I'd like to put out there. First up, the day after the convent, a co-worker brought in an article from The Dispatch and Rock Island Argus, called A Community Knit Together. The article detailed a knitting group that meets Tuesday Nights at the Fairmount Branch of the Davenport Public Libraryat 6:30 pm. The group is the Fireside Knitters and what's so cool about them is that they create blocks that are then sewn into afghans for the knitting charity Warm Up America!. Warm Up America! was created by Evie Rosen, who just so happens to be a great friend of my grandmother's. Together they worked at Evie's shop, The Knitting Nook, in Wausau, WI. The shop is not open anymore, but my Grandma Marge has given me some of her stash over the years and other fun stuff like this awesome canvas duffel bag! The next group I want to tell you about is called, believe it or not, The Knitting Nook. The Knitting Nook is a new group that meets on selected Wednesdays at the Buzz Cafe in Eldridge. I read about it in this article from the Quad Cities Times. After reading the article, I tried to find contact info for the founder, Tammy, but I couldn't. Imagine my surprise when I signed on to Ravelry today, and there was a message in my inbox from Tammy herself! 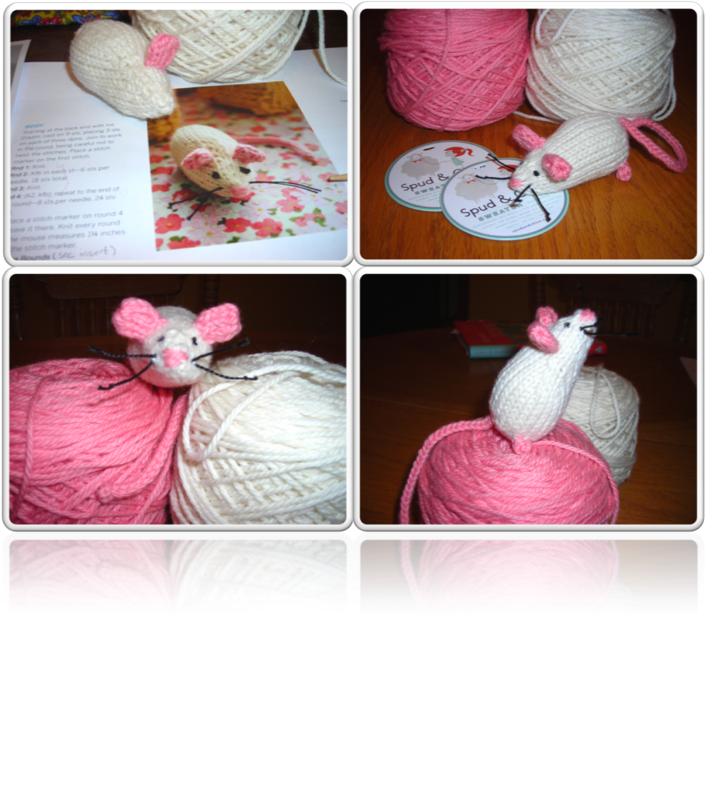 Apparently she knows Miss Effie, and she stumbled upon this blog in Ravelry! I'll definitely be making an appearance to this group soon. Their next meeting is next Wednesday, February 16 from 3pm - 5pm. 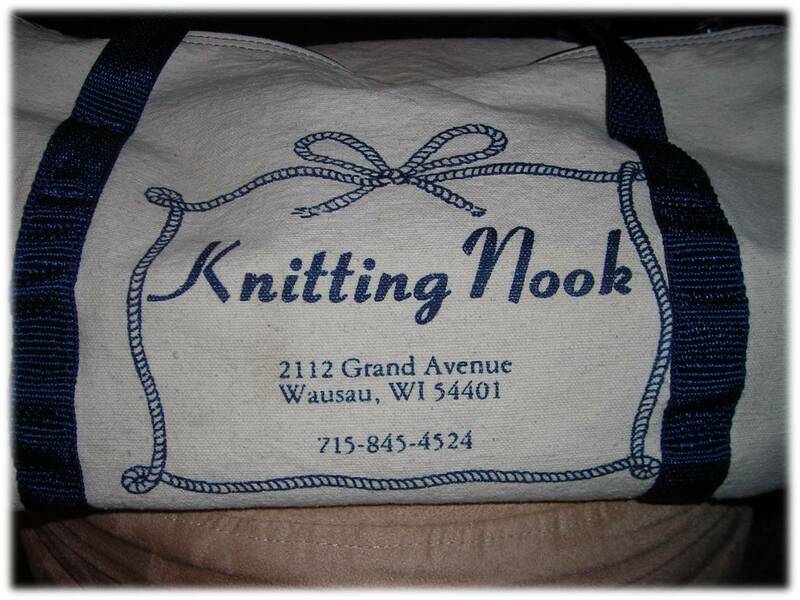 You can RSVP at the Knitting Nook blog, which is linked above. Also important to note are the knitting nights at Serendipity Yarn Shoppe. 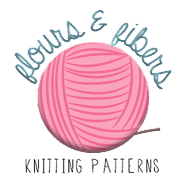 They have a full calendar, including knit nights on the First and Third Thursdays of each month at the shop in Muscatine at 6 pm. I've been to their knit nights quite a few times and they are always fun! This post is pretty long, so I'll sign off for now. But soon I'll tell you all about the knitting workshop I'm taking with Susan B. Anderson! !